Whether you're having cranberry sauce made from an old family recipe or the kind plopped straight out of the can, the tart berries will likely grace your dinner table around this time of year. As you're passing the bowl around this season, drop some of this cranberry knowledge on your family. Maybe they'll be inspired to include them on the menu more often. 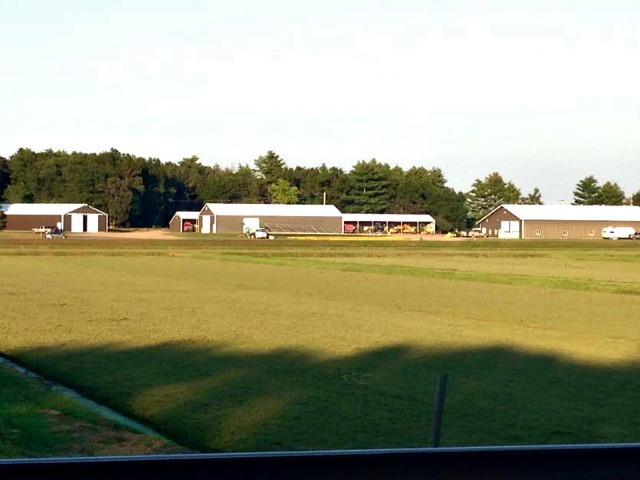 DO CRANBERRY FARMERS INTENTIONALLY FLOOD THEIR FIELDS? Because of their natural internal air pockets, cranberries float. So, instead of walking row by row through a field and picking tiny berries from low-lying shrubbery, farmers flood their fields to bring the berries to the top. Then, they use water reels called “eggbeaters” to churn through the fields and beat the berries off of the vines. After that, it’s just a matter of corralling the berries and loading them up. The above method is called "wet harvesting," and it's, well—wet. Corralling the berries into trucks requires the farmers to get out into the bogs themselves, so the waders keep them dry. There's also a method called "dry harvesting" that doesn't require waders: Farmers walk the non-flooded fields with a lawnmower-like machine that plucks the berries from the vines. Wet harvested berries are the ones used for things like sauces and drinks (and make up 90 percent of the cranberry harvest); you'll find the dry harvested berries in bags in the produce section. DO CRANBERRIES GROW IN A GIANT SAND BOX? Because cranberries are harvested using water, a common misconception is that they grow in water. Actually, they grow in a giant sand box. Dikes are built around the bogs to box the plants in so farmers can then flood the fields. At the bottom of each “box” is a layer of sand that has to be almost perfectly level across the entire bog in order to ensure proper drainage. And though you may be picturing rake-wielding farmers meticulously combing the land as if it’s a giant zen garden, they’re actually much more high-tech about it: They use laser levels. WHERE ARE MOST OF THE WORLD’S CRANBERRIES GROWN? 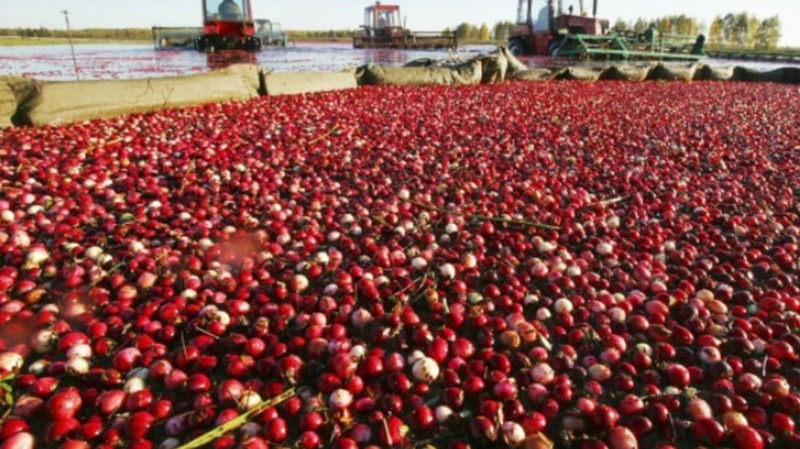 People often think of cranberries as a New England crop, but it’s Wisconsin that has the market cornered with 5 million barrels produced in 2015. That’s more than half of the world’s supply. For reference, the U.S. overall produced about 8.4 million barrels. WHY DO WE EAT CRANBERRIES DURING THE HOLIDAYS? If that first Thanksgiving had cranberries on the table, they certainly didn’t resemble anything we eat today. The Pilgrims’ sugar supply was long gone, and there’s no record of them using sugar to sweeten cranberries for relishes and sauces until half a century later. But cranberries were native to the area, so it’s possible that they were otherwise represented in the feast. The practice of serving meats, like poultry, with citrus fruits, certainly isn't new. It is a tradition that is thousands of years old and likely originated in the Middle East. Turkey and cranberries have been associated with each other since the beginning of the country, especially in New England. The 1796 cookbook American Cookery suggested to serve turkey “with boiled onions and cramberry-sauce [sic].” But the main reason we eat cranberries around the holidays (as opposed other favorite 19th century poultry toppings like peach sauce) is more practical—cranberries are harvested from September to November, meaning they’re perfectly in season when we chow down.